Quilled Clematis with Purple Flowers on a White Picket Fence. The project that I want to share with you today is a quilled clematis with purple flowers on a white picket fence. I started working on it last week, but because I had a few custom orders pending, I only managed to finish it yesterday evening. It was hard to decide what variety of clematis to quill because their flowers come in so many beautiful colors and shapes. I probably spent an entire day looking at pictures and only after I pulled on my desk all the purple/pink papers that I have, I decided to go for this gorgeous, rich purple shade. The total size quilled painting is 23cm * 23cm. The diameter of one flower is approx. 7cm. I used 2 tones of purple with the lighter shade in the middle to mimic a real petal vein. I made a whopping 25 paper leaves, but ended up using “only” 21 of them. The buds were a little bit tricky and I don’t know how good I managed to make them resemble the real ones, which are long and very thin. Usually, when I have to make branches with leaves and flowers, I can never get it precisely from the first try. I arrange the leaves, add the flowers, but I always feel like one of them is not in the right place and I end up tearing everything apart and start all over again. For some reason though, this was the very first time when I didn’t have this problem anymore. It could be because the design is fairly simple, but nonetheless, I am happy that this time I skipped that dreaded step! As for the background, I wanted to make a white picket fence. I hand cut each element and then painted the cardboard with acrylics. The last layer was applied with a sponge in order to achieve a washout effect. 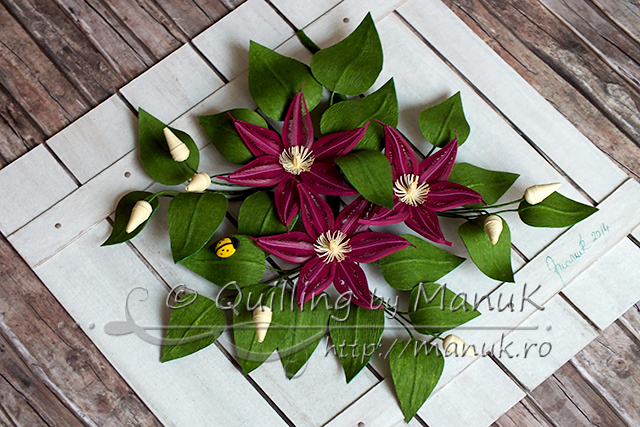 I hope you liked my quilled clematis flowers! Thank you for your visit! Simply indescribable! You did a great job! Thank you very much, Gordana! Hugs! Manu! I love their rustic look! It reminds me my home 🙂 Brilliant! Kate, I am glad you like it! 🙂 Thank you so much! Hugs! Sathya, thank you very much! Hugs! Absolutely beautiful!! And your blog has become lighter – I like it. Absolutely stunning piece of quilled work !! Multumesc mult de tot, Cris! Ma bucur ca ti-a placut! 🙂 Pupici! So beautifully arranged, You always get it right and it is so delightful for us to watch. Like a nice gift each time you post. Thank you so much for your lovely comment, Suganthi! Its Beautiful !I loved the flowers and dimension you have given to the leaves and bg looks awesome! Thank you very much, Pooja! ManuK, wonderful job! And it is in vain you are worried about the color combination. Everything is done with great taste and only moderate. Manu, tell me, from what material the leaves? Larisa, thank you very much! You can read more about how I make my paper leaves here: http://manuk.ro/en/2013/08/stemmed-paper-leaves-tutorial/. These particular ones are made from crepe paper. Hope it helps! I’m totally speechless. This is one of the most amazing quilling work I’ve ever seen. It’s really hard to believe that it was made with paper. Congratulations! You are very talented person. Barbara, what a lovely comment! You really made my day, thank you so much! Hugs! Draga mea,nu stiu de ce vin mai tarziu dar stiu ca cei din urma vor fi cei dintai! Nu incetezi sa ne surprinzi cu toate creatiile tale asa incat sunt coplesita…Multe aplauze pentru tot si toate! Sau mai bine mai tarziu decat niciodata! 🙂 Aurelia, multumesc frumos! E o placere sa citesc comentariile de la tine! Pupici! Neat and Very Pleasant. Your pieces remind me of those russian quilling. almost the same style and same level of perfection. Keep up the good work. Its just wow !! I can’t believe quilled flowers could look so beautiful. Keep up the good work. can you show us how to make the leafs ? Can you please post a tutorial or the steps on how to make that ladybug . I guess its a simple tight circle turned into dome and den markings made with black pen ,and a black quilled roll for its head . Please confirm that I have guessed it right. You did great job, aii of them are beautiful !